Fastbraces®, as the name suggests, are fixed braces designed to move teeth faster than traditional braces. 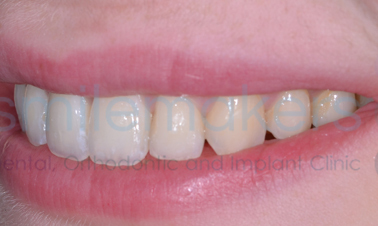 They are generally used for less complex cases than Damon® braces, and are not suitable for everyone. 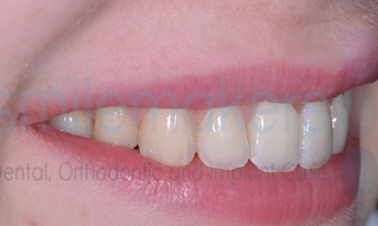 The whole experience, from the initial consultation through until the removal of my braces has been fantastic. No longer do I fear the trip to the dentist! I can't thank them enough for my wonderful new smile. Over the past 9 months I have undergone orthodontic treatment and the skill and expertise of both my dentist and orthodontist has been top quality. The dentists are highly skilled within the sector, yet apply a personal touch and truly care about their patients. 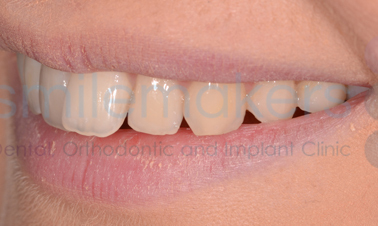 It is a pleasure to be a patient with Smilemakers and I would certainly recommend the practice wholeheartedly. 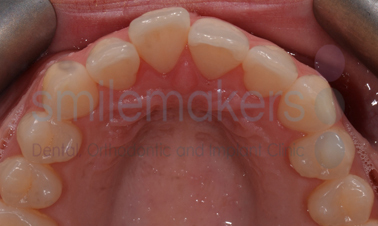 Sarah attended for a consultation because although she had orthodontic treatment as a child, the teeth had relapsed and left her upper central incisor in an unattractive position. After discussing the various options available to her, Sarah opted to have Fastbraces. A beautiful result was achieved in only 6 months. 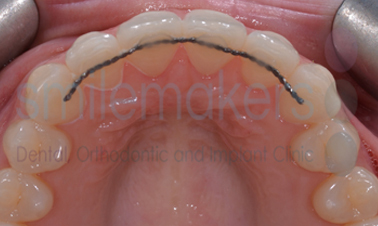 The Fastbraces® Technology patented bracket design uses unique, triangular shaped braces that allow for the use of just one super-elastic nickel-titanium wire during the treatment process. This brace technology works on an entirely different mechanical principle altogether. Historically, old braces would move the crown of the tooth in the first year, and the root of the tooth in the second year. The Fastbraces® Technology helps move the crown and root of the teeth at the same time, resulting in average treatment times of about a year. It has been developed and tested over the past 20 years and is now becoming available in countries around the world. Fastbraces® Technology is fast, safe, easy and affordable treatment that comes with a lifetime satisfaction commitment from the dentist. What are the benefits of Fastbraces? The speed of treatment can be faster than Damon®, although this is not always the case. 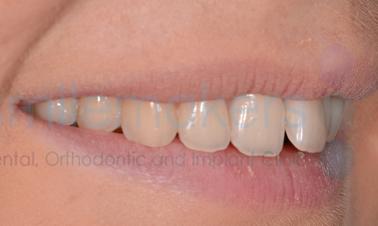 Your Smilemakers dentist will be able to advise you during your consultation. University Research has shown that Fastbraces® Technology had 'lower sensitivity', 'a clear-cut reduction in sliding friction' and 'the lowest mean frictional forces' compared to the old brace systems. For the consumer looking for an aesthetic cosmetic solution, Fastbraces®Clear™ ceramic brackets can help disguise the presence of braces on the teeth. Fastbraces® Providers are committed to their patients for a lifetime. If for any reason you need to see a Fastbraces® provider, no matter where you are, you can seek out any of the dentists in the ever growing network of providers!